Some insight into this statement—and how it relates to shared church—has come in the past few weeks. To prepare for an adult Sunday School class on prayer, I searched the New Testament for what we might call “asking” (often called “petitionary”) prayers and for instructions on what to ask in prayer. Surprise! Out of some 70 references, 41 had to do with praying for Christians. I found only 2 examples of prayers for non-Christians to come to faith in Christ. As I pondered this great difference, those prayer-words of Jesus came back to mind: “I am not praying for the world, but for those you have given me.” The New Testament prayer-pattern seems to echo the prayer-priority seen in Jesus’s words to his Father. Of the prayer-references listed, just over 58 percent are for believers, while less than 3 percent are for unbelievers. Why? Does God not care about seeing unbelievers trust Jesus and so come into right relationship with him? Of course he does. God loves the world. He does not want “anyone to perish, but everyone to come to repentance” (II Pet. 3:9). So why did Jesus say he was "not praying for the world"? In the same prayer, Jesus repeatedly asks that those first disciples and later Christ-followers be one, that they might be “brought to complete unity” (Jn. 17:11, 21-22). The demonstration of this unity, Jesus says, will enable the world to believe and to know the Father had sent him. So Jesus is concerned for the unbelieving world. But he knows that the eye-opener for a spiritually blind world is the display of heaven’s unity lived out by Christians on earth. His prayer-priority, then, is for Christ-followers, for the community he launched and left here for the world to see. Read again all those prayers for Christians—prayers that God’s colony and colonists on earth will thrive spiritually so that the world may have access to samples of the coming Kingdom. Should we, then, pray that non-Christians trust Jesus. Yes—two of the prayers listed do so. But if we are to pray the New Testament way, it seems that most of our asking should be for fellow believers. Our loving one another, Jesus said, would provide the world with evidence that we are his disciples. And one-anothering prayer turns out to be a major part of loving each other. That’s one more reason we need to learn how to practice New Testament praying in shared church. Online classes. They’re everywhere. They cover everything—from doing aerobics to playing the zither. For the past five years, I’ve taught an online course for the Bakke Graduate University. The class aims to help Christians connect their faith with their daily work. Unexpectedly, teaching this course has sharpened my insight into shared church. Like the church, my online course operates in two modes—synchronous and asynchronous. In synchronous mode, the whole class “meets” online in a Zoom Room. Computer microphones and cameras let us see and hear each other. 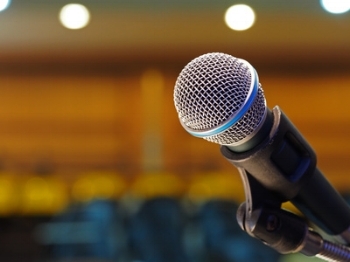 So we can present ideas, ask questions, clarify, explain, challenge, illustrate, or whatever. In asynchronous mode, students work separately. They complete assignments such as reading books and articles, watching videos, or posting their written responses to assignments. In a similar way, the church acts in two modes—gathered (synchronous) and scattered (asynchronous). In gathered mode, we assemble. For most churches this happens on Sundays. When we gather, we should encourage and spur each other on (Heb. 10:24, 25). In scattered mode, we live out our faith at a distance from each other—in our homes, workplaces, and neighborhoods. When we scatter, our paths intersect with those in the world who need grace and light and salt. Suppose, in a synchronous class session, I switch off all the students’ microphones (as professor, I have the power to do that). In that case, I now hold the only live microphone. If, during my presentation, I say something confusing, students have no way to ask me to restate my point. Or if a student recalls a perfect illustration from her own history, she cannot share it for the benefit of the others. Why do we meet in synchronous sessions? Doing so allows a far richer, fuller learning experience. All of us—including me, as the professor—may profit from the gifts, understandings, and perspectives of everyone else. So if I were to shut down all the other voices except my own, I would deprive students of that fullness. Losing the benefits of the synchronous mode takes its toll on what happens in asynchronous mode. Let’s say I ask a guest to facilitate a Zoom Room session on how our God-given spiritual and natural gifts relate to our daily work. A main purpose? To equip students when working by themselves in asynchronous mode. What they gain from the insights of our guest and his or her dialogue with the class should make them better able to handle their individual assignments. By turning off their microphones, I greatly reduce what they will take away. What happens when we hush Christians in our church meetings? This leaves them unable to strengthen, build up, and encourage one another with their unique gifts. The loss will show up when they disperse into the roles God has placed them in during the other six days. In other words, the absence of mutual body-building when we gather will weaken our ability to carry out God’s mission in the world when we scatter. In that world-field, the challenges to faith and fruit-bearing can overwhelm us as individual seeds. Bosses harass. Neighbors annoy. Family members let us down. Promising sprouts from the seed can wither. Our love and service can easily chill. World, flesh, and devil all conspire to bring us down. For that reason, we need to structure our times together so that the body “builds itself in love as each part does its work” (Eph. 4:16). Yes, the Lord as our Good Shepherd restores our souls. But one of the main ways he does so is through the mutual ministry of the gathered church. We, together, serve as the Shepherd’s Body. All members of the body need the freedom to go about “doing their jobs,” to offer the body during synchronous sessions what God’s Spirit has gifted them with. Trevor Withers serves as team leader at Network Church, St. Albans, UK. 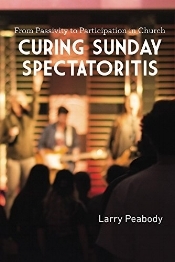 An account of how that church practices shared church appears in Chapter Six of my book, Curing Sunday Spectatoritis. In the following blog, Trevor provides additional insight into how Network Church cultivates participatory Sunday meetings. I have been reflecting on some of the unseen areas that make increased participation possible in our Sunday morning meetings. There are a number of these, so I just want to take this opportunity to highlight them and share some thoughts. Let's start with the fact that Network Church encourages small groups which have a high level of participation. You might be asking what this has to do with Sunday mornings. Well, I think quite a lot. These small groups have environments where people are encouraged to be real, open and honest, and to look at applying their faith to everyday life. This earths our spirituality and, through facilitative leadership, enables a depth of contribution and participation. Because this is a strong part of our church culture, it seems very natural for this same engagement to happen in our Sunday mornings. So the small groups act as a learning and developing space, which builds confidence for people to then participate in the larger setting. They are used to hearing their own voices, they are used to their ideas being accepted, they are used to speaking about spiritual things and making links with the everyday. They are used to giving and receiving prayer. So when this sort of opportunity is offered as part of our Sunday gathering, it seems like a natural place to be. One of the things that makes this possible is good facilitative leadership in the small groups and the same is true of our Sunday morning space. I think it takes courage for a leader to open up the space, ask a question, propose an opportunity for people to speak. It is more natural perhaps to do this in a small group but equally possible on a Sunday morning and the same skills are required. The main one being to shut up and wait! One of the key values held by the central leadership team is to provide spaces and opportunities for those that are part of Network to be encouraged in the things that God is calling them to do in their lives beyond this Christian community. We are not trying to get people to commit to church programs or ministries. Instead, we want this body to be supported in the various things that each individual or group of individuals has on their heart. This means that when an opportunity arises for participation, there is a sense in which it is anticipated that individuals will bring things from their week, share the challenges and joys of living out their faith, and be prayed for and indeed encouraged in what they are doing. So, in essence, the church exists to support those who are part of it to live for Jesus 24/7, rather than the church existing for its members to run the various programs that it offers. Staying with the central leadership team, one of the things I have noticed is that, true to our name, we network. In doing so, we pick up all sorts of stories from within this Christian community, taking time to listen and reflect on what God is doing amongst us. This enables us to gently prompt those who have had a recent experience of God in their lives to share that in our Sunday gathering. We would never pounce on them unannounced, but as part of our leadership might seek to create an opportunity, or ask a question that gives an opportunity, for what we have discovered to be shared in a more public space. One of the often-defended areas of Sunday church life is the pulpit. My friend Laurence Singlehurst describes us as having an "open pulpit." In his experience of travelling around many churches he is aware that this is somewhat unusual, as most church pulpits are "closed," by which he means they are occupied by a relatively small, specially-chosen group of individuals. It is interesting to reflect on the scripture that is part of the “one anothers”—“teach and admonish one another”—from Colossians. This is one of the factors that encourages us to have a more open pulpit. In practice what this means is that we have a team of individuals that speak regularly which, as a percentage of our numbers on a Sunday, is about a quarter. Over and above this, we are always on the lookout for people who have things on their heart which they can bring to us in this teaching/sermon slot. For some this might be speaking twice a year on a particular topic or area that they are passionate about or have insight in, for others is might be occasional and prompted by something they have been learning or have found helpful from a different context. An unseen area that enables all the above to work well is someone taking responsibility for co-ordination and communication, as one of the functions of their leadership, picking up the details of who is going to speak when on what, and gently following through with people who have hinted at the possibility of having something to say and making a space available for them to deliver this. Another facet of the atmosphere at Network is that we think of ourselves more as saints than sinners. It is quite difficult for sinners to feel that they can make a contribution, whereas if we appreciate each other as saints then this creates a very different feeling. Now, of course, we sit in the tension of living in both of those spaces, and I am not for a moment suggesting that we have gathered a more saintly bunch of people than any other church, but the fact that we view this particular Christian community through glasses that see them as saints and encourage them to act as such I think enables a sense of well-being and encouragement and draws out contribution. These are just a few of the unseen areas that help to encourage engagement, participation and a sense of shared ownership around our Sunday meetings. This is by no means an exclusive list, and I'm sure there are other dynamics at play. Not least of which would be the fact that we have been developing this culture for a number of years and have established rhythms and patterns which enable it to be sustained and developed. Church music—a topic sure to stir lively back-and-forth—came up just before we said our farewells at a recent men’s retreat. I suggested that those in church congregations should have a voice in choosing the songs. Others doubted that could work. But we had run out of time, leaving no opportunity for further discussion. So I returned home praying and thinking about how to make music selection participatory in a shared-church context. Most importantly, does the New Testament support making song choice participatory? In I Cor. 14, Paul clarifies the right use of spiritual gifts in a church meeting. In v. 26 he opens the door for anyone to bring a song to the assembly: “When you come together, everyone has a hymn. . . .” (NIV). “Has” translates a Greek word that can mean having something to share with others. Paul knew God had given his Holy Spirit to each Christian for the benefit of everyone. Back then, one-anothering reached even to mutually selecting songs to sing as they gathered. But can we realistically let people in 21st century church settings take part in music selection? No one wants to return to the so-called “worship wars” that pitted organs against guitars and hymns against contemporary choruses. Above all, we should aim for the unity Jesus prayed for in John 17. Drawing on my years of experience both on the platform and in the pew, I will propose a way to include the congregation in picking the music that should actually encourage unity. What follows are merely suggestions. I hope they will trigger further discussions and even better ideas. 3. Melody. Is the song singable to those in the congregation? Do intervals, syncopation, difficult rhythms, notes too high or low, or other characteristics put the piece out of reach of non-musicians? The benchmarks should be few and easily grasped. Once leaders have adopted them, they should occasionally present and explain them to the congregation. The church bulletin could include a simple form inviting people to nominate songs for congregational singing. The form could ask for the song title and the author (to prevent confusion over identical song titles). Space could be provided for briefly stating why the one suggesting it finds the song meaningful—perhaps God used it in calling them to Jesus or in their subsequent spiritual growth. The form should also make it clear that the suggestion will be reviewed and that filling out the form does not guarantee the song will be used. The completed song-suggestion forms could go to a small task group. To guard against this group becoming an entrenched power bloc, its members should serve for only a short time—perhaps two or three months, followed by another group. Each could include a younger member, an older member, and someone from the church’s music team. This group would evaluate each suggestion, asking whether it meets the church’s song-selection criteria. Songs that qualify could be passed along to the platform leaders. As the number of congregationally selected song suggestions grows, those leaders could select from the pool those that fit what they might need for any particular meeting. When appropriate, the song-selector’s reason for choosing it might be shared with the congregation. 2. Old Songs and New. Because everyone would have opportunity to take part, the Sunday morning songs would include recent compositions (such as “There is a Redeemer” or “The Potter’s Hand.”) as well as musical treasures from the past (e.g., “It Is Well with My Soul,” or “To God Be the Glory”). 3. Across Generations. Such a plan would permit everyone, from children to seniors, to participate in the song-selection process. As a result, the music would reflect the life of the church body and not simply the tastes of one music leader or team. Older and younger generations could learn from and come to appreciate what each has to offer. What do you think? Would a process something like this one increase participation your church? What changes might you suggest? In Mark Greene's "Sacred Secular Divide" video, a public school teacher describes the lack of prayer support for her work. How does your administrative work in a public school carry on God’s purposes for life on earth? What unique opportunities does your work provide for you as a Christian? What challenges do you face in these roles? What opportunities exist for retired people to serve as volunteers in your school? How can our church pray for you and for your school? In our neighborhoods and workplaces—in this case a school—the paths of Christians intersect most often and most relationally with those who do not know Christ. Only in a shared-church context can a congregation become aware of the opportunities and challenges their fellow believers face in their scattered-church roles. The two school officials I interviewed lead a team of teachers and staff of 120 who are responsible for the safety of 765 children. They create the environment in which these children learn to read, write, do basic math, and live in community. The principal and her assistant also deal with hundreds of parents. Clearly, the opportunity to shine the light of Christ and live out his love is enormous. Regularly gathering in "audience mode" works against whole-church support. Only in shared-church mode can we get to know what others do during the other six days of the week. Only in shared church can we learn how to pray for the scattered church. TV antenna versus cable connection: how can the difference illustrate an important truth about shared church? Stay tuned. How is it possible today? When I got out of bed this morning, my body reminded me how shared church works. Eyes saw the numbers on the clock. Brain interpreted those numbers as time to roll out of bed. Legs and arms went into action to move me from mattress to floor. Feet carried me to the kitchen. Fingers pushed buttons to start the coffee-maker. Heart, lungs, nerves, etc., all chipped into the getting-up project as well. Each part of my body shared in the work of getting my day underway. The New Testament says the church is a body. Its various parts—each one uniquely made to contribute—are to work together to carry out the chores that belong to the whole body. Arms and legs, if unable to move, severely curb what a physical body can do. In a church body, some ways of gathering together can immobilize members, so that only a few carry on the work. Such paralysis turns the church into an audience. But we are “members together of one body, and sharers together in the promise of Christ Jesus” (Eph. 3:6). In shared church, we don’t just spectate. We participate. When Was Shared Church Impossible? Back before Jesus came and did his work on earth, the Jews met together in various ways. But in most Old Testament assemblies, the Israelites met as audiences. Moses and Joshua “told the people” (Num. 11:24; Josh. 3:5). God spoke to his people through priests, Levites, and prophets. Ezra the scribe “stood on a high wooden platform” and read the law to the people (Neh. 8:4-13). Although God had intended for his chosen people to serve him as “a kingdom of priests” (Ex. 19:6), they shank back from coming near to God themselves. At the giving of the Ten Commandments, “When the people saw the thunder and lightning and heard the trumpet and saw the mountain in smoke, they trembled with fear. They stayed at a distance and said to Moses, ‘Speak to us yourself and we will listen. But do not have God speak to us or we will die’” (Ex. 20:18-19). So at the foot of Mt. Sinai, the stage was set for a largely one-way, monovoiced, meeting format in ancient Israel. Shared church was impossible under the Old Covenant, in part because the people insisted that someone else listen to what God said and then pass it along to them. How Is Shared Church Possible Today? But things took a sharp turn under the New Covenant. Jesus, by his death and resurrection, won our forgiveness and gave us access to God’s throne. Upon his return to the right hand of his Father, God fulfilled a promise made hundreds of years earlier by Joel, the prophet: “I will pour out my Spirit on all people. Your sons and daughters will prophesy, your old men will dream dreams, your young men will see visions. Even on my servants, both men and women, I will pour out my Spirit in those days” (Joel 2:28-29). The presence of the Holy Spirit in all Christ-followers—and his gifts to us—make shared church possible today. He is not only “with” but “in” us. He provides gifts of knowledge, gifts of speaking, gifts of serving others. He teaches us, counsels us, guides us. Unlike God’s people in Old Covenant days, we don’t have to rely exclusively on a few religious professionals who tune in to God and tell us what he says. Being gifted by and filled with the Holy Spirit is the birthright of everyone who trusts Jesus. Yes, in some, the Holy Spirit’s gifts make them able to help fellow Christians discover and develop their gifts. Church leaders are to serve as coaches, activators, trainers of apprentices, so that God’s people become doers—not merely hearers—of his Word. As a result, “the whole body [church] . . . grows and builds itself up in love, as each part does its work” (Eph. 4:16). In this way, under the New Covenant, shared church is possible today. But it’s still too easy to revert to Old Covenant-style meetings that rely on religious professionals doing most of the work. 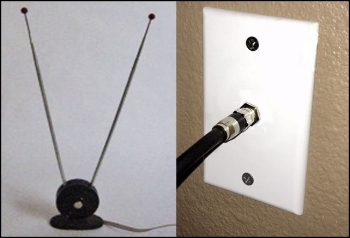 I’m old enough to remember climbing onto the roof to install a TV antenna and fiddling with a set of “rabbit ears” on top of the television set to get the best signal. When I was young, we had access to just one channel that brought us a fuzzy, black-and-white picture. Today, we have access not only to countless TV channels but also to the Internet—no longer through clumsy antennas but through coaxial cables. In some ways, the bygone days of rabbit ears and rooftop “antlers” are like meetings under the obsolete Old Covenant. Pretty much one-way communication. We and our television sets were mere receivers. A few professionals—news reporters, actors, musicians—prepared the programs for us, which we passively consumed. Of course, even with cable TV we can still veg out as couch potatoes. But cable has opened opportunities that resemble the kinds of church meetings now possible through the Holy Spirit under the New Covenant. In the cable era, terms like smart TV and interactive television have entered our vocabulary. Cable allows me to teach theology-of-work classes via the Internet. The students and I can share in back-and-forth interaction not only in writing but also via Zoom. In an online “Zoom Room,” we can see each other’s faces and hear each other’s voices by means of our computer cameras, microphones, and speakers. “When you meet together, one will sing, another will teach, another will tell some special revelation God has given, one will speak in tongues, and another will interpret what is said. But everything that is done must strengthen all of you” (I Cor. 14:26, NLT). Antennas work only as intakers. Cables permit give-and-take. Church meetings patterned on Old Covenant gatherings are largely one-way events. But meeting formats like those found in the New Testament allow both giving and receiving. The explosive growth of the early church took place in just that kind of a context. Unintended messages. Are we sending them by the way we “do church”? And can such messages block shared church? Clearly, watching me had appealed to something in Brad. But to what had it appealed? To the desires sin overstimulates in every one of us. To be noticed. To be seen as special or important. To be looked up to. He could realize those desires, Brad reasoned, if he were to become the solo “talker man,” the only one up front with the microphone Sunday after Sunday. Had I meant for Brad to get this idea? Of course not. Until I asked the question, I had no idea what message he was receiving. He was not experiencing “shared” church, but church that made one person seem hyper-important. This over-focus on one member of the body comes from the system we have all inherited from our church traditions. Like other pastors, I was arranging the church meetings Brad sat through, doing so in line with what years of church gatherings had ingrained in me. From my earliest days, gathering with other believers on Sunday took top priority. During my growing-up years, I probably sat in on 900 or more church meetings. Each time, the sermon formed the centerpiece—mostly spoken by the same pastor week after week. When I was about 12, our pastor’s wife pulled me aside and said, “Larry, we are expecting to hear great things from your life.” Those were her words. But I heard this unintended message: “Larry, we are expecting you to become a pastor or missionary.” No wonder, then, that by the time I left home for college, I believed that I ought to serve in one of those ways, if I wanted my life’s work to count for anything. Just the other day I spoke with a man far younger than I who also received this unintended message. He recalled that his church experience had taught him that “the greatest thing you could possibly do was to go into 'full-time service.' You were expected to go to a Christian school so you could become a pastor. The highest calling, full-time vocational service, was somehow better than going into sales or some other line of work.” He recalled two peers, a young man and young woman, who had been led to think only "full-time Christian service would please God." Having received the same “call” to serve as cross-cultural missionaries, they concluded they should marry. Sadly, they were ill-matched and soon divorced. The New Testament provides many examples of our sinful leanings toward self-inflation. The Pharisees placed themselves in positions “to be seen” by others (Mt. 6:5). Jesus’s original disciples asked him, “Who is the greatest in the kingdom of heaven?” (Mt. 18:1). When they argued over which of them outranked the others, Jesus traced their dispute back to a desire to be “first” (Mk. 9:33-35). They tangled over the same issue during the last supper (Lk. 22:24). James and John, with Mom's help, lobbied for top spots in Jesus’s kingdom (Mt. 20:20-27). Some 50 years later, in a church setting, Diotrephes wanted to be “first” (III Jn. 9). The culture outside our churches feeds this drive to be in the catbird seat. We once took some four-to-seven-year-olds to a children’s museum. One exhibit featured an elevated platform and some play microphones. The kids pushed and shoved to be on stage and at the center of attention. Rock concerts, political rallies, and TV shows all send the message that to be seen and heard by a crowd is the mark of success. "Take a microphone out of my hands," says Willard Scott, "and I'm just plain folks." Blogger Mike Cosper writes: “Celebrity culture turns pastors and worship leaders into icons.” This not to say that every pastor or musician is motivated by the need to be noticed. But when we make superstars of church leaders, we may be stirring something in the flesh of others that needs not to be cultivated but to be put to death. The remedy? It seems almost too simple. 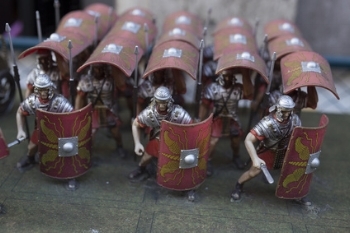 New Testament churches avoided focusing on just one leader by having several. Notice these plural leadership terms: The church in Antioch had “elders.” Paul and Barnabas appointed “elders in every church.” Paul told Titus to “appoint elders in every town.” The church in Jerusalem had “elders.” Philippi had “overseers and deacons.” James refers to “the elders of the church.” And Peter writes of “the elders among you.” The New Testament uses overseers and elders interchangeably. According to Paul, they should be “able to teach.” This suggests not only ability but also opportunity. This was shared church! Not only did the gathered believers share in encouraging each other, but in the New Testament churches, even leadership and teaching responsibilities were shared among those with such gifts. Young people learn not just from sermons on Sunday mornings but also from the way we practice meeting. If they invariably see the same person on stage week after week, what unintended message may we be sending them? What’s worse than anticipating a root canal? Visualizing ourselves confessing sin in front of the gathered church. First, the image of dirty laundry flapping on a clothesline flashes past our minds. Second, there’s the dread of what others will think and say—and spread. And third, for many, the fear of public speaking intensifies the shudder. Have you ever had a sneaking suspicion that you just weren’t good enough? That no matter how hard you try, you just don’t have what it takes? I know I have. It’s something that has haunted me for my entire life. For as long as I can remember, I have struggled with the idea that I’m somehow lacking. As a child I felt awkward, unable to connect with my peers. I was sure I could never be as relaxed and confident as the other kids appeared to be. At home, even though I was always quite sure that my parents loved me, I never felt quite sure that I deserved it. Those very same misgivings also applied to my relationship with Christ. I became a Christian at a very young age. I’m not even sure just how old I was; only that it was a long time ago, in a Sunday school classroom, joined in prayer by a teacher whose name I no longer remember. I was very lucky in that way, to be raised from infancy in a Christian home. My parents were also regular church attendees. Some of my earliest memories are of time spent in Sunday school. As I got older, I became active in youth group, went to Christian summer camps, and participated in missions work. I got to know other Christian kids my own age and made some good friends. And yet, the older I got the more I felt like a fraud. I couldn’t escape from my continuing sense of inadequacy. I was certain that I was not as good a person as those around me. If they only knew my secret thoughts and secret sins I was sure they would recoil in horror. I often wondered how Jesus could love me when I couldn’t even love myself. Then, in my teenage years, I began to surround myself with people that didn’t make me feel so inferior. I found people who had no place for morals or judgment. My new friends drank alcohol, did drugs, partied, lied, stole, and slept around. Eager for acceptance, I joined in their lifestyle with hardly a backward glance. And although I continued to think of myself as a Christian, I avoided attending church. I couldn’t help comparing myself to the others there and thinking they would all look down on me. After all, I wasn’t living a Christian lifestyle. My season of disobedience, self-loathing, and perpetual running from God lasted for more than 10 years. At the end I found myself divorced, and living back at home with my parents, and feeling utterly lost. It was then, at a time when I was more broken than I had ever been, that I began to turn to God for healing. You see, even though I had spent many years running from him and his judgment, he was never far away. In fact, throughout my long rebellion, he never once gave up on me. He was just waiting for me to be broken enough to realize my need for him. My return to faith wasn’t easy. It didn’t go perfectly. I struggled and backslid more than once. The biggest hurdle of all was my shame. I knew that God offered perfect love and forgiveness through Jesus Christ, but I had a very hard time accepting it. More than ever I knew that I could never be good enough. But, with a will surely strengthened by God, this time I didn’t give up. I read my Bible. I started attending church more regularly. I practiced confessing my sins and asking God’s forgiveness. Slowly but surely I began to feel the presence of Jesus in my life. Then I met my future husband, Matt, a seeker like myself, and things began to snowball. I could feel the hand of God gently pushing us together. We began attending Northwood together and in it found a welcoming place where we could grow in our rediscovered faith. When we were married a year later, we committed ourselves to regular church attendance and raising our children to know and love Jesus. Since that time, my faith has continued to grow. Every day I come to rely a little more on the power of God’s sustaining love. As for my feelings of inadequacy, the truth is I still struggle. The difference is that I no longer have to struggle alone. I know now that I can take my weakness to Jesus and that he will use it to make me strong. I know that even though I will never be good enough in this life, God will still love me and forgive me and continue his work in me as long as my heart remains open to him. When we regularly include authentic stories from the scattered-church lives of God’s people, some of those accounts will include divulging wrongs. Hearing such forthright reports goes a long way toward restoring the connection with reality that can so easily get lost in our church gatherings. True-to-life FaithStories, like this one from Rachel, can cut through the time-encrusted layers of religiosity. Hein’s article does not discuss church music. But can his diagnosis of this missing element in American music shine light on the state of singing in our Sunday gatherings? Would you call the music in your church mostly “presentational” or “participatory”? My own experience in churches over the past few decades points to a “lack of participatory music” in congregational singing. But why? Let me suggest two reasons—reasons relating to the people in the pews (or chairs) and to those on the platform. I believe that when we gather as Christians the New Testament puts a priority on one-anothering. So, yes, I confess to looking around during “worship time” to see whether that’s happening. In doing so, I watch mouths. Typically, in half or more of the people, I see lips moving. Even though I sit within earshot, I usually can’t hear what—or if—they are actually singing. In the rest of the people, I see lips remaining sealed. To my way of thinking, neither lip-syncing nor lip-sealing counts as real singing. What, I ask myself, explains what I see? Are people today unwilling to sing? Unable? No, because when songs like “Amazing Grace” or “Lord, I Lift Your Name on High” come along, sealed lips open and nearly everyone sings with audible voices. Why, then, the lack of heartfelt participation with so many other songs? Too often, stifled voices apparently result from unsingable songs. Songs written for musicians to perform can easily outdistance the musical reach of those in the typical congregation. Another reason for the “lack of participatory music” in church gatherings comes from up front. First, the “worship team” has probably rehearsed that Sunday’s songs several times during the scheduled practice time. Most likely no one in the congregation has had the time or opportunity to master the melodies, intervals, cadences, and pauses. Second, someone on the platform has chosen what to include in the musical menu for the meeting. This song-selector (as each of us does) will have selected music that suits his or her musical tastes. So, week in and week out, the decision-making on the music is non-participatory. Again, the congregation has no voice in this. Third, those on the platform hold a monopoly on the microphones. Any sound from the stage—whether voice, drums, guitar, or keyboard—can be boosted to a volume that will overwhelm even the strongest unamplified voice coming from the pews. Some musicians on the platform wear earphones to hear each other. Hearing the congregation, on the other hand, often appears to be secondary or even irrelevant. The New Testament says very little about music in Christian gatherings. So, when it does address the subject, we need to pay careful attention. Two verses speak clearly to the matter of Christians singing in community. Both verses put signing in the context of of one-anothering. 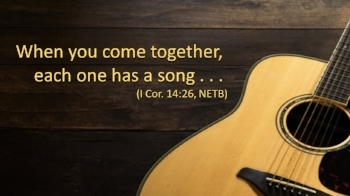 Through “psalms, hymns, and spiritual songs,” we are to “speak to one another.” Those same musical genres show up in the Colossians verse that says to “teach and admonish one another.” Both verses link this kind of singing with making music “to the Lord” or “to God.” In one-anothering—even our musical one-anothering—we obey Jesus’s new command (John 13:34-35). And he himself said that by obeying him we show our love for him. In this way, our one-anothering becomes worship. But, of course, to speak, to teach, and to admonish one another in song requires that we hear each other. Neither lip-syncing nor lip-sealing permits listening to one another. Nor can we hear each other if the amplified sound from the stage overpowers all voices from the congregation. In a blog, Jordan Richmond wrote: “I attended a church service . . . and felt almost assaulted by the sound (around 90-95 db).” And John Stackhouse, in a Christianity Today article asks: " Why does everything every Christian musician performs nowadays seem to require high amplification?" By noting why we should not give up meeting with other Christians, the writer of Hebrews indirectly explains why we should gather: to “spur one another on toward love and good deeds” and to “encourage one another” (Heb. 10:24, 25). Notice—again—the twice-repeated reason given for meeting together: one-anothering. In concerts, we rightly expect presentational music. We go to enjoy hearing talented artists perform. But in our regular church meetings, the New Testament calls us to gather for another purpose--to build up and strengthen each other. This one-anothering purpose calls for participatory music. In this way, the Body of Christ "builds itself up in love, as each part does its work" (Eph. 4:16). 1. Give the congregation a voice in choosing the songs. Paul’s instructions for church meetings in Corinth imply that those present could participate in song-selection (I Cor. 14:26).